The Republican strategy during the 2012 election has been to try to pin the economic problems we have been facing on President Obama. Certainly President Obama inherited a mess and it is very difficult to figure out how well the president’s policies are working since we don’t know where we would have been without them. The price of gasoline is something we are reminded of every time we fill up our car. 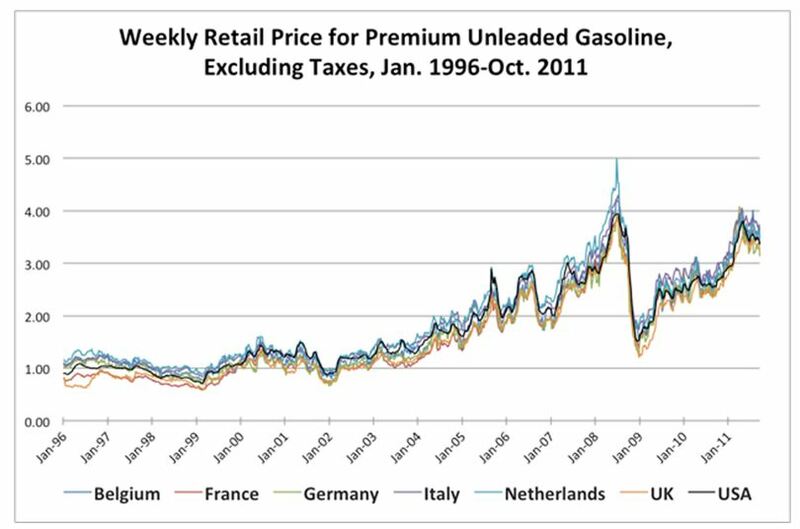 So we’ve heard a lot about the price of gasoline during this presidential election. During the presidential debates, Mitt Romney said to president Obama ,”At the same time, gasoline prices have doubled under your presidency.” Bill O’Reilly in his debate with John Stewart said, “Gas prices have doubled since Obama took office.” And someone at Exxon Mobil even cooperated with this theme by placing the gas sign on the right on the Internet. And, it is true. However, the conclusion drawn from it is not. 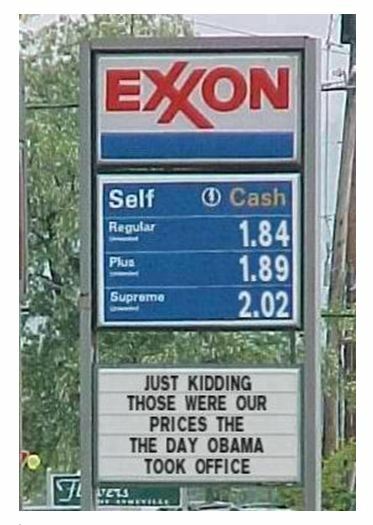 The implication is that Pesident Obama is responsible for our current high gas prices. You can only think that is true if you have a very short memory or are very dishonest. Average US gas prices hit a historic high of $4.12 per gallon in July of 2008, six months before Obama took office and while George Bush was still president. The International Energy Agency (IEA) graph below shows the historic prices in the US and other countries, showing that the US President is not responsible for gas prices. That is unless you consider the wars in the Middle East, which destabilized the region, to be a main factor in gas prices. The graph shows the gas prices were relatively stable until about 2002. Exxon/Mobil has also been a little duplicitous about this. In the past, they have emphasized on their website that the high gas prices are reasonable when they are considered in terms of inflation. However, now that Mitt Romney has promised oil companies carte blanche to do pretty much as they please if he is elected, they’re only too happy to blame the rising gas prices on President Obama. Mr. Romney apparently does not believe in climate change, and even if he did he certainly places money ahead of almost everything else, including the environment. Mr. Romney has promised that he would allow completion of the XL pipeline, which will make lots of money for the oil companies. He would also allow them to drill on public land, in National parks, in wildlife refuges, and in environmentally sensitive areas. Those policies might be okay if it were not for the fact that they would increase air pollution, increase greenhouse gas concentrations, and put a large number of environmentally fragile areas at a risk of being damaged. And, it is very unlikely that allowing oil companies to do as they wish would bring down the price of gasoline. In the first Presidential debate, Mitt Romney blamed President Obama’s policies for limiting oil production. That is also not true, as you can see from the IEA’s table below. Oil production dropped during the Bush presidency but has risen by about 20% during Obama’s presidency. It is clear that domestic oil production has little effect on the price of gasoline. Last year our largest export was fuels, so it seems if we produce more, we will just export more while gas prices continue to rise in the U.S. It also appears that gasoline prices do not follow the law of supply and demand, both things that Exxon/Mobil and the other oil companies should have to explain. They receive large subsidies; their products do not bear the cost of dumping large amounts of CO2 into the environment; and they have been quite profitable while many other US companies are struggling to stay afloat, in part because of the high fuel prices. Many are international companies that have little allegiance to the United States, but if they’re going to do business in the United States, they should behave as good citizens. We should certainly not let their money and misinformation determine the outcome of our elections. 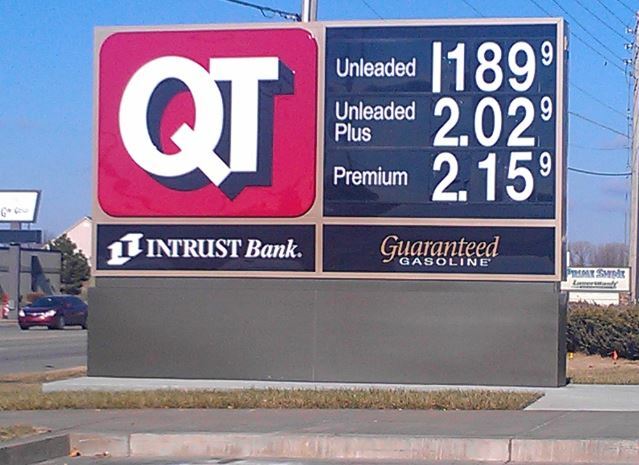 Note added on 02/17/2015: This picture shows the gas prices in January of 2015 in Kansas. Does President Obama get credit? This entry was posted on Saturday, October 13th, 2012 at 7:59 pm	and is filed under National Politics. You can follow any responses to this entry through the RSS 2.0 feed. You can leave a response, or trackback from your own site. are yor contact details though?